In 1974, Pasquale “Pat” and Giovanni “John” Viscariello, brothers from Airola, Italy opened their first restaurant in the small town of Kingston, Massachusetts. They decided to name their restaurant “Mamma Mia’s” in honor of their Mother. Their wives Maria “Francesca” and Eugenia “Jenny” worked beside them. Their children, Salvatore “Sam”, Antonio “Tony”, Gina, and John, grew up in the business, making pizza boxes by the hundreds until they were tall enough to reach the pizza counter. 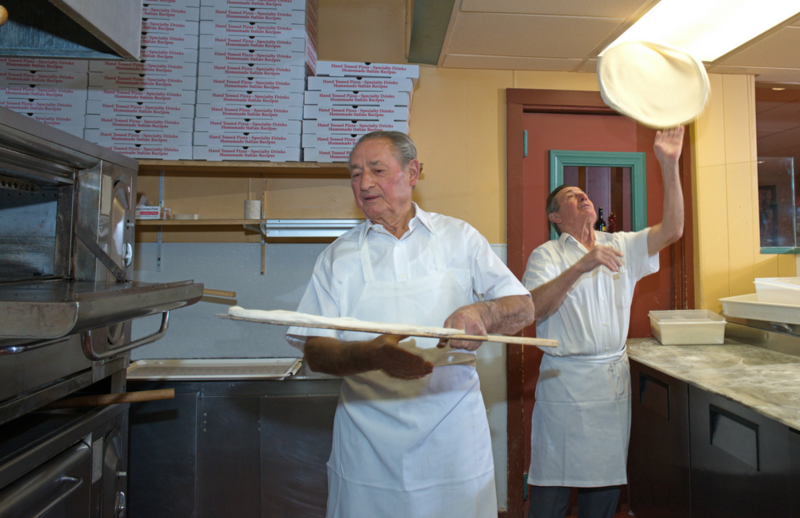 Over 40 years later, their grandchildren are hand tossing pizza and learning the business. Mamma Mia’s quickly became known as “the first name in family dining.” Inspired by integrity and traditional family values, the generations continue working together serving the highest quality authentic Italian food. The mission today remains unchanged: provide superior hospitality, reasonable prices, and old world Italian food with great pride and dedication. Mamma Mia’s offers homemade pizza, pasta, and more! Accepting applications for all full and part time restaurant positions. Must be at least 16 years of age to apply. Click here for our online application. If you are interested in a long-term career opportunity working in an atmosphere where delicious food, paired with great wines and outstanding hospitality are the focus, this is the place for you. Our established family restaurant group, with locations in Hanover, Marshfield, Kingston, Plymouth, Carver, and Plymouth Pinehills has proven successful for more than 40 years. Apply in person at any Mamma Mia’s/Carmela’s Restaurant or fill out our online application. Click here to view our Mamma Mia’s location addresses. You can also send your resume to Peggy Dickinson at pdickinson@mammamias.net.